We are a professional SEO agency in Glasgow. Get a free video analysis and quote today. Digital marketing with proven results. Looking to increase your web rankings, traffic, leads & sales!? Get in touch today. We are a Glasgow-based digital marketing, design and SEO agency. We utilise our world class knowledge and experience of SEO, digital marketing and design to help businesses & brands maximise their online potential and meet their online customers. We offer one of the most price competitive services of any of the top tier agencies around in the Uk with web design packages & SEO pricing structures to fit any business. Since I started in this business, I have sought to bring clarity, transparency and trust to an industry that has built itself a reputation for massively over-promising and wildly under-delivering. Consistently brilliant results, phenomenal communication and a long list of happy clients are ongoing proof that myself & my team are delivering. We are a goals-driven agency. We use hard data to establish ambitious objectives and to monitor progress and report back with sensible, meaningful milestones and statistics. As a result, we have gained a reputation for being one of the UK’s leading digital marketing, design and SEO agencies. Many of our team & contacts around the world are considered industry thought-leaders. When you work with us, you can be sure that you’ll be dealing with the best possible people to help transform your business online. Delivering transformational and sustainable growth for our clients does not come easily. It takes expertise, creativity, time and meticulous planning. It takes passion, innovation and an absolute refusal to finish any job until it is perfect. 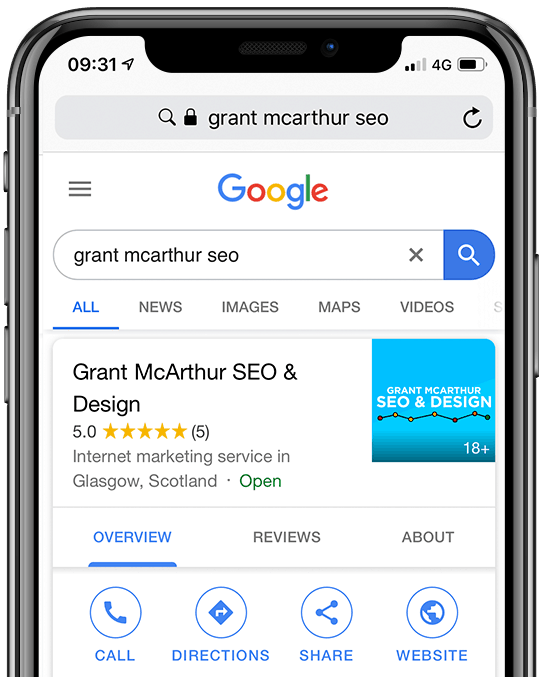 Still want to find out more about why we are considered by many to be the number one digital marketing, design and SEO Agency Glasgow has to shout about? Give me a call. I’d love to hear from you. What is SEO? – How Does our Glasgow SEO Agency help your Business? – What is our Search Engine Optimisation process? Our first priority is to learn everything about your business; your products, your services and the ideal type of customer you intend to target. This gives us a picture of the information your customers want to know. The next step is to conduct a website audit so we can identify the strengths and weaknesses of your website. We then put a strategy in place to improve pages that are underperforming. Search engines rely on keywords to correctly index pages. What’s more search engine crawlers rely on keywords being in specific locations so they can match search engine queries accurately. URL’s should be neat and tidy. Not only does this help search engines correctly index a page, but also builds trust with visitors. If the structure of your URL looks spammy, visitors will not trust you are an authentic and reliable business. If visitors cannot easily navigate your website, they will leave. And they probably won’t come back. Web users expect to be able to find what they are looking for quickly. The structure of your website’s navigation is therefore one of the most important aspects of SEO. Search engine favour webpages that have unique, informative copy. If you have duplicate content on two or more pages, search engines will not rank them. Our duplicate copy check remedies this problem and also identifies third party sites that may have stolen your content. Backlinks are a boon for websites. However, they can also be damaging. If you have too many backlinks from low-quality sites, search engines may consider this a suspicious activity and downgrade your rankings. It is therefore in your best interests to review backlinks and remove any that could have a negative impact on your website. We look at your top online competitors, find out what is making them rank compared to your site reverse engineer it, and improve on it greatly. Everything else we have looked at on your site we have looked at on theirs too.